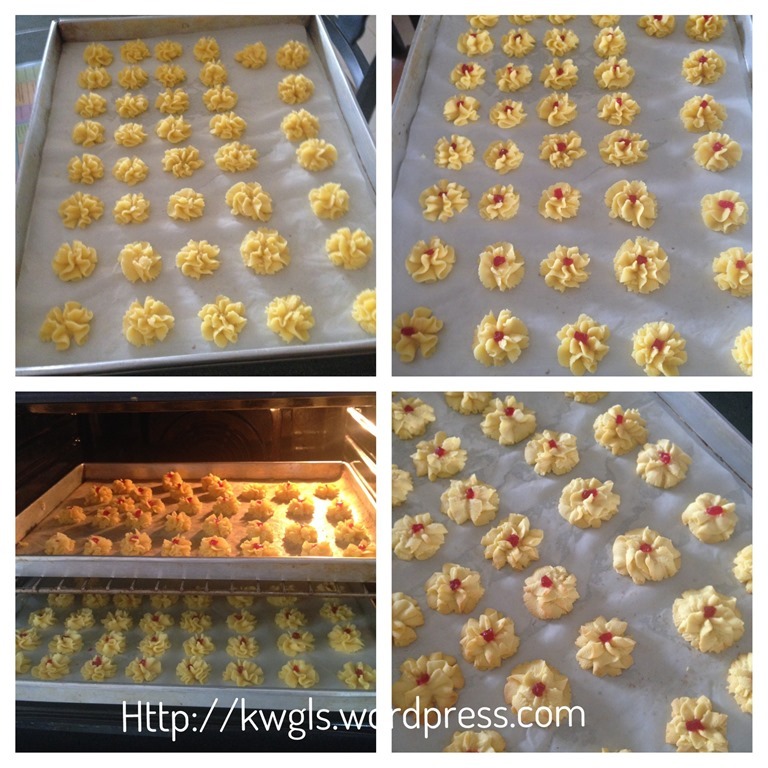 Hari Raya Aidilfitri is approaching and our Muslim brothers and sisters are busy preparing the cookies. 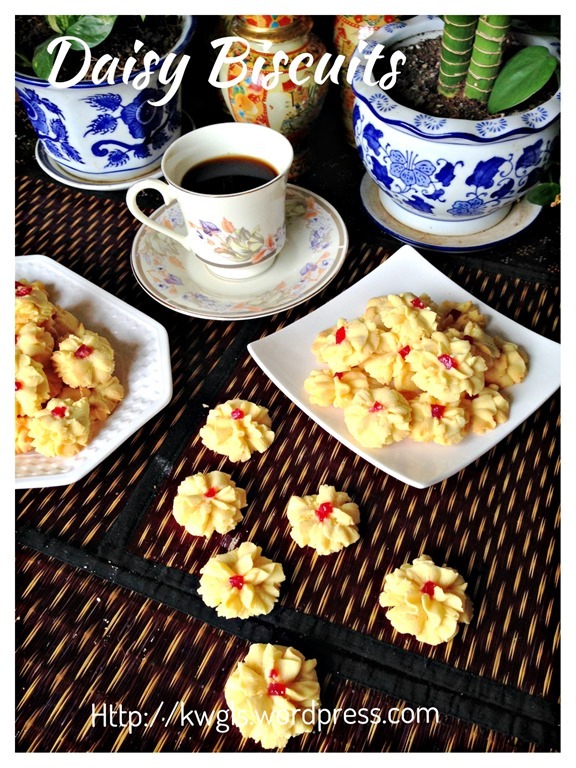 When the owner of a Facebook Group posted a link to recipe of Biskuit Semperit or Biskuit Dahlia, I studied with great interest as it is one of the most common cookies served during the 1970’s and 1980’s. In fact, until today, it is still very common during the festivals like Chinese New Year and Hari Raya. 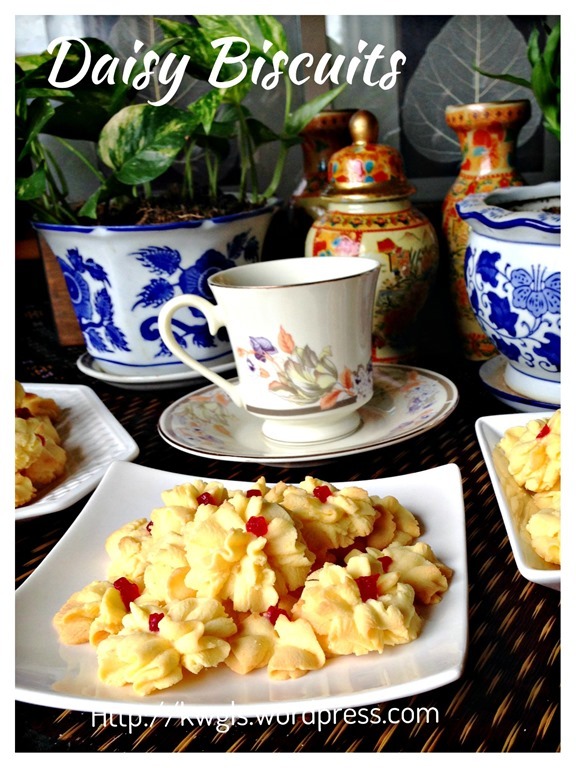 The cookies is easy to prepare but it capture the hearts of many elders because it is beautiful and delicious. 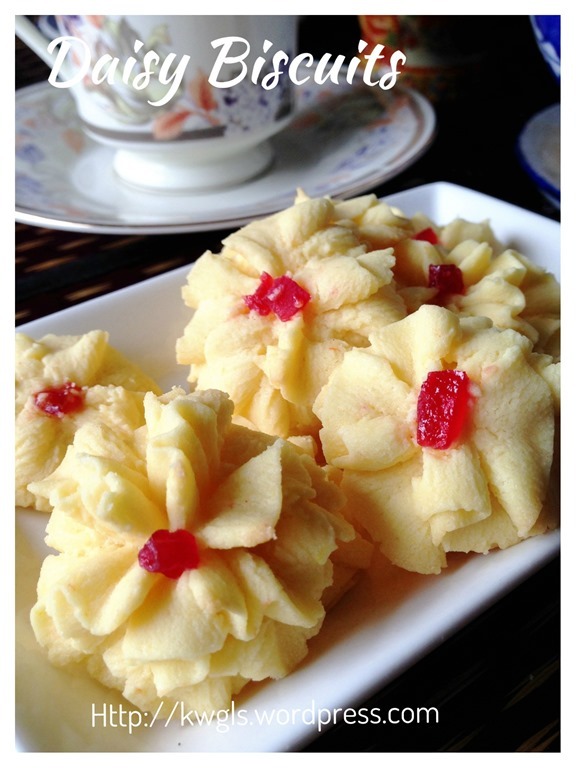 It is made using simple ingredient of butter, flour, sugar and eggs. 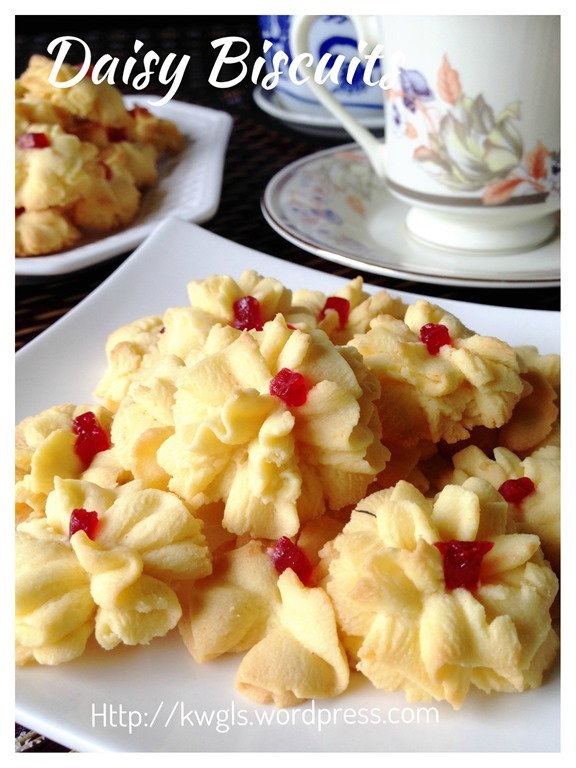 Occasionally, custard powder was used to enhance the cohesiveness, the texture, the flavour and the colour of the cookies. It is supposed to be shaped like a daisy flower, however, with the availability of new piping tips, more and more flower shape were created. 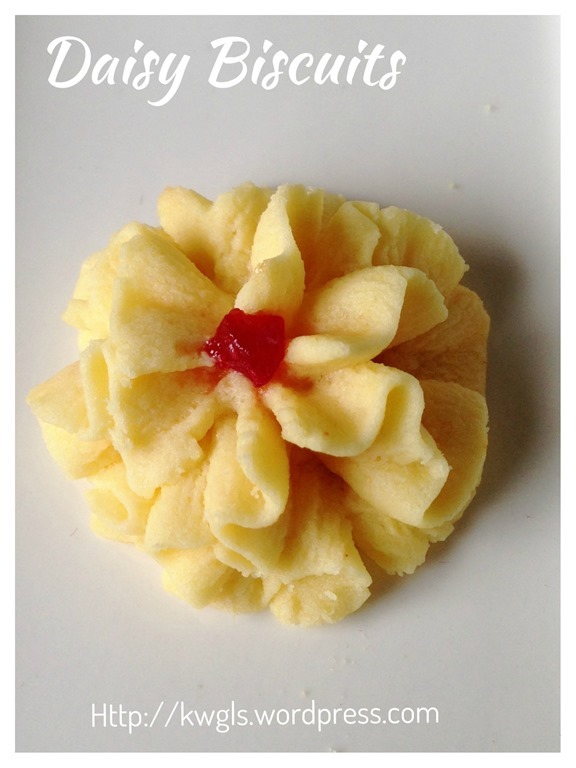 I have piped my batter using Wilton 1M tip, cater for the creation of big swirl of rosette in cake decoration. 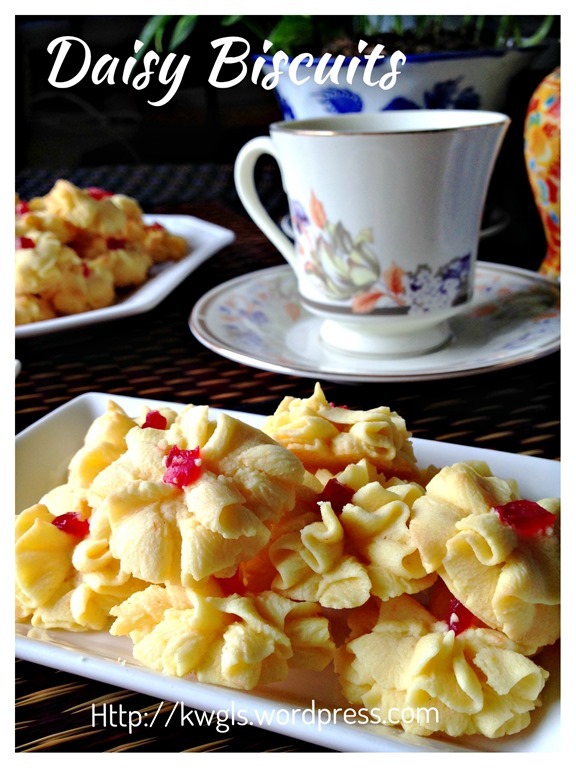 There are many names and the most common colloquial name is “melt in the mouth “ cookies. 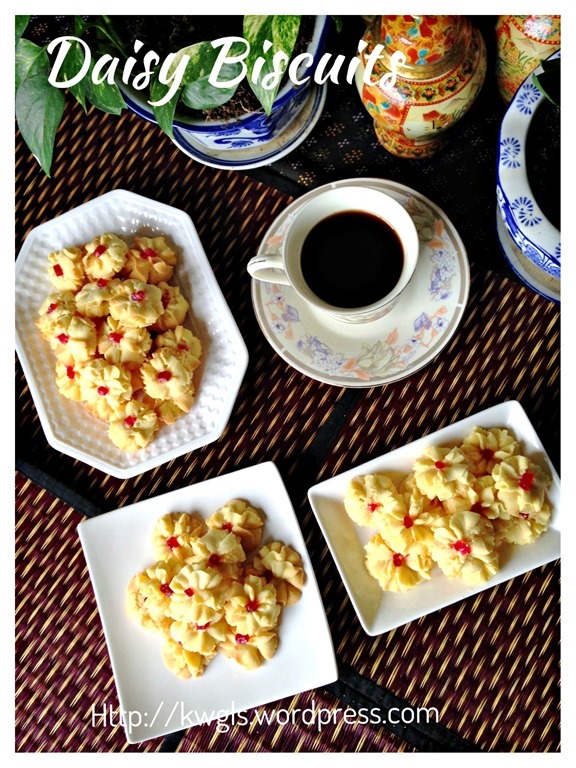 At time, they called it “cherry cookies” since there is a small pieces of cherry sitting on top of the biscuit. 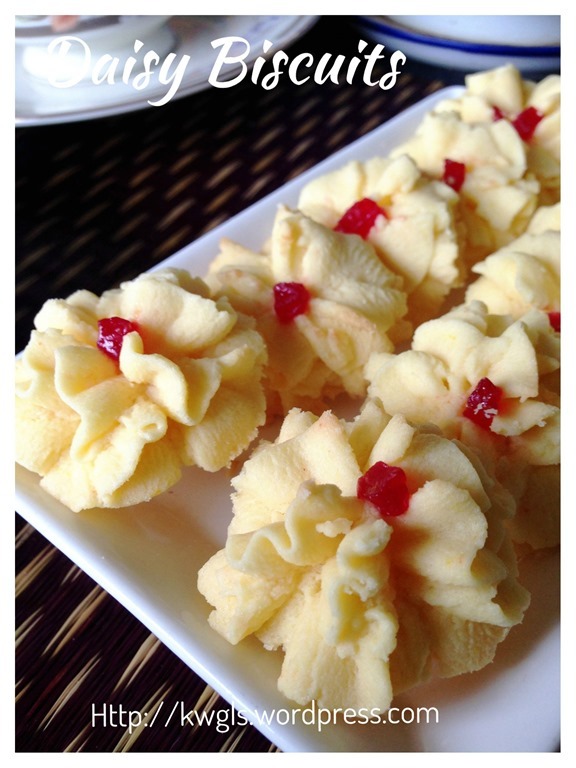 However, in Mandarin, it is called 挤花饼干 or literally translated as “piping biscuits”. 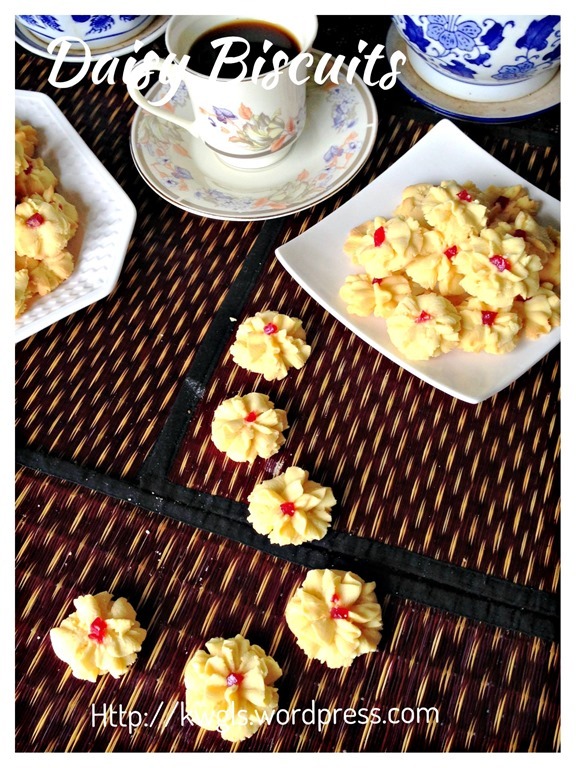 In Malay, it is called Biskuit Semperit (piping biscuit) or biskuit custard (custard biscuit) or biskuit dahlia (Dahlia biscuit). Pre-heat the oven to 170 degree Celsius and get ready some baking tray lined with parchment paper. 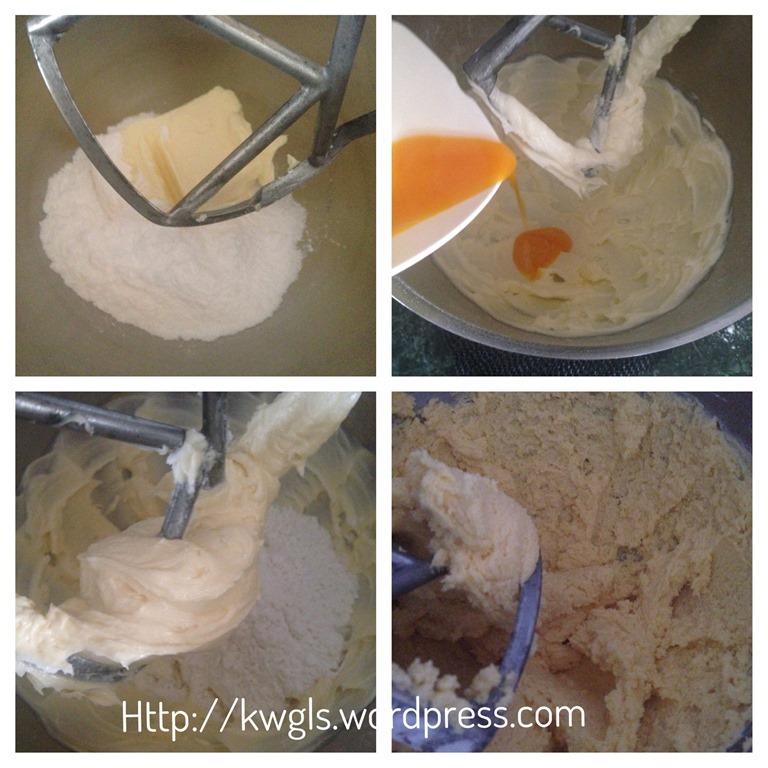 Cream the butter and sugar using a standing mixer until light and fluffy. Add in egg yolks and vanilla essence. Beat until well combined. Gradually add in the custard powder and cake flour in 3 phases, use the machine’s lowest speed to “stir” until well mixed. Note you can hand fold the flour if you wish. Transfer the batter to a piping bag fitted with desired tip (in this illustration, I have used Wilton tip 1M and other suggested nozzle as per original recipe is star 2cm nozzle). Pipe the batter into a baking tray lined with parchment paper. 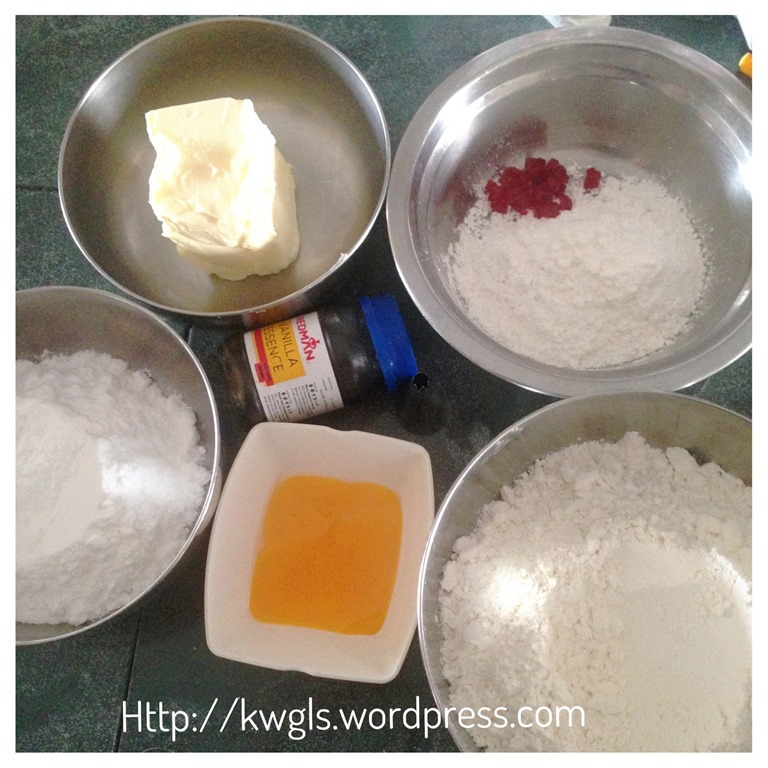 Put a small diced cherry on top of each cookie. Bake in the pre-heated oven at 170 degree Celsius for about 15 minutes. Once taken out, let it rest in the baking tray before transfer them to a cooling rack for cooling. Cool completely before store in an air tight containers. If you have never try this cookies, chances are you are much younger than I do. 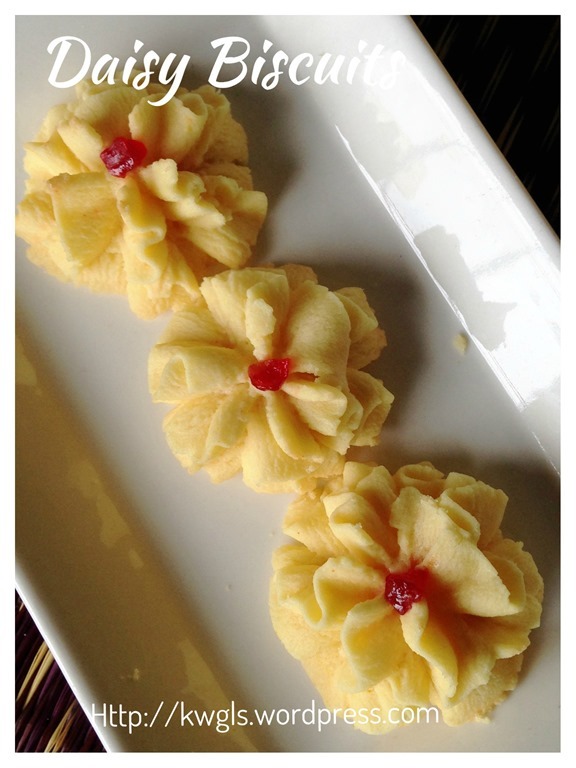 If that is the case, do give it a try and you will understand why this cookie is so popular among the elderly that bring lots of fond memories to them. 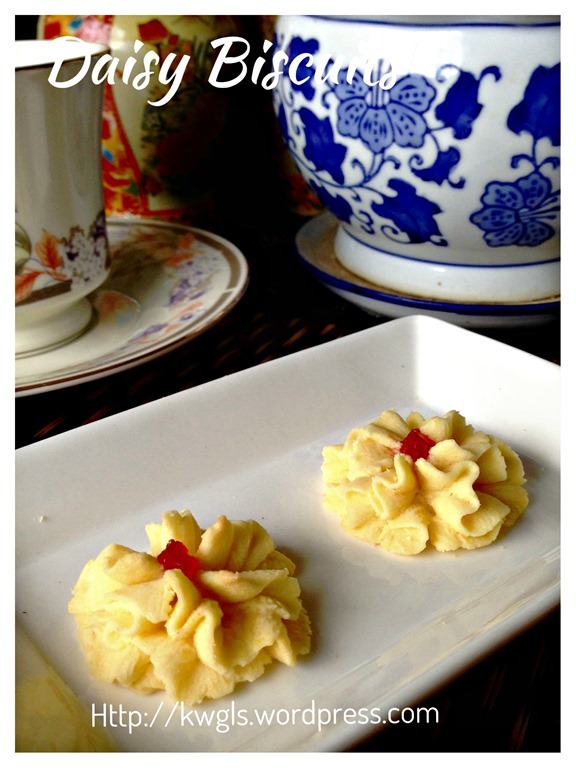 This recipe was included in Page 14 and Page 15 of the following E-book. 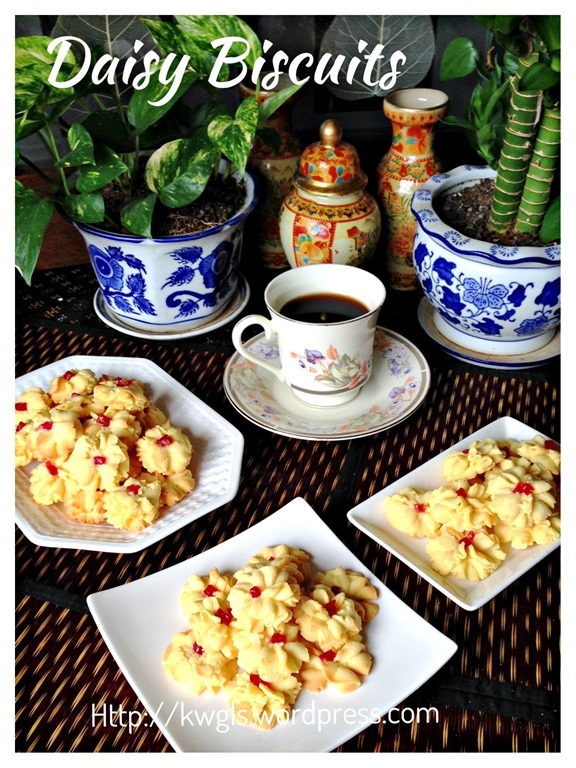 This entry was posted in Cakes and cookies, Chinese and Asian Cakes and Snacks, Food Preparation Series and tagged 8, biskuit custard, Biskuit Dahlia, Biskuit Semperit, daisy biscuits, GUAI SHU SHU, Guaishushu, kenneth goh, postaday, 挤花饼干. Bookmark the permalink. Do these cookies melt in the mouth or are they crispy? Looks very pretty. Can I leave out the custard powder?